I’m so excited to be writing my first Recipe Redux post!! This month’s theme is all about cooking once and eating twice to stretch your cooking efforts into a double dinner. I knew right away what I was going to make. I always have leftover steak and chicken, since I usually grill in bulk to have extra lean meats on hand. The Best Ever Grilled Chicken Marinade that I posted back in 2012 was one of my most pinned recipes. It’s so crazy how some of my easiest recipes are the most popular! I guess that we all love an “easy button”, right?! I love this marinade because it’s from made from scratch, with minimal ingredients, and gives an incredible flavor to beef or chicken. You can alternately use lemon in place of the lime in the marinade. Rinse asparagus, pat dry and remove the ends. Roast for about 15 min until lightly golden (cook time will depend on the thickness of the asparagus, so check them after the first 10 mins. Heat a saute pan over medium heat and toast pine nuts, stirring constantly, until fragrant and lightly golden, this usually takes less than a minute. Set aside. Whisk together lemon juice, lemon zest, white balsamic vinegar, olive oil, garlic, honey, dijon and salt and pepper and set aside. Fill a large salad bowl with mixed greens. 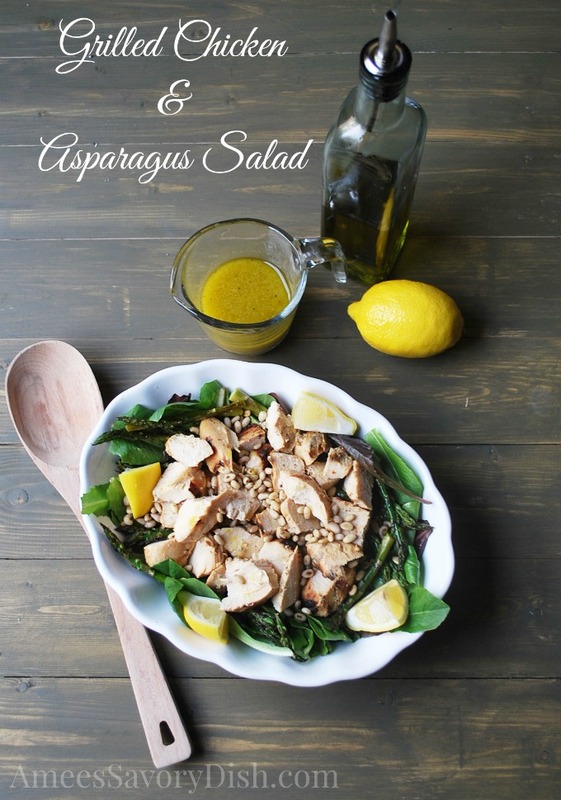 Chop roasted asparagus into thirds and place on top of greens. Add chopped grilled chicken, then sprinkle pine nuts over top. Drizzle lemon vinaigrette dressing on top, toss and serve immediately. Don’t miss out on all of the other amazing creations from my Recipe Redux friends below! 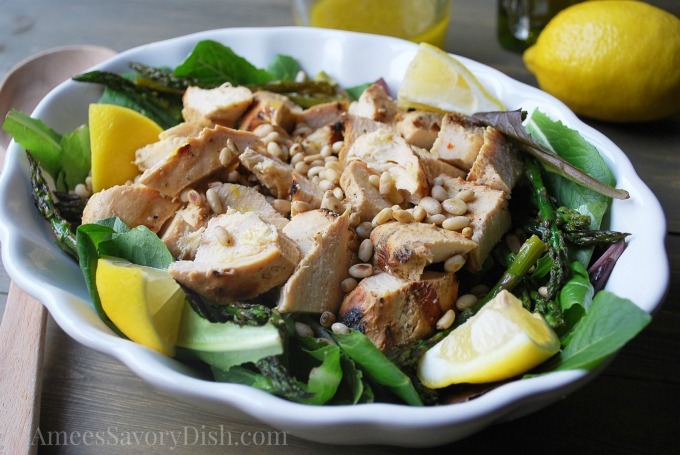 This is a great way to use up leftover chicken and I love the pinenuts in it. Congrats on your first Recipe Redux post! I have been filling up on salads hoping they will bring on summer quicker… 🙂 Love all the textures and flavors you have going on in this – what a great use of leftover chicken! Love this salad! Asparagus is a great Spring veggie!